Earlier this week I posted about how I was pretty sure the only way I was going to achieve my 2015 weight loss goals was if every time I opened the refrigerator or pantry, a big fat hand came out and slapped my big fat face. My name is April, and I have a problem with snacking. I love snacks. Especially cupcakes and Cheez-its. I could quite happily live off of both of them. My biggest issue is not having a meal plan. I eat whatever is easy. Sometimes it's a banana followed thirty minutes later by entirely too many Cheez-its. Or for lunch, soup with way too many slices of cheese and crackers. ...followed twenty minutes later with a cupcake. Then there's the holiday nonsense I over indulged in... Let's just say I lost my mind way too many times at the dessert table. I've had to draw the line. I've had to turn back to MealFit to get my family back on track. 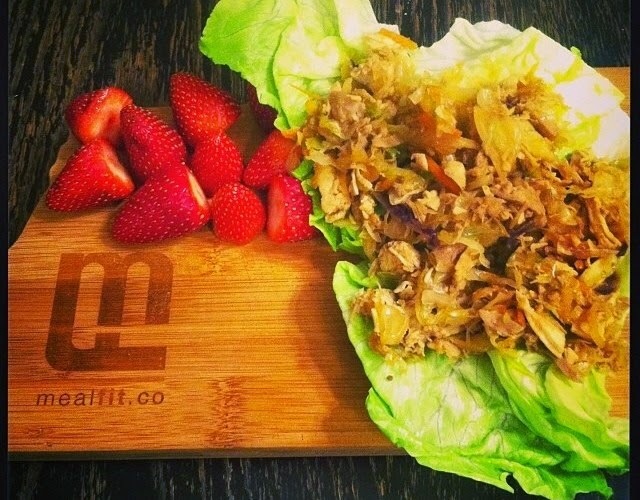 Some of you remember last fall when I first partnered with Thomas Cox, the founder of MealFit. Thomas is a competitive Crossfit athlete and former college football player and coach. He's taken his knowledge from years of being a machine athlete, to create, MealFit; a 95% Paleo monthly meal plan subscription service. Each week I get a full meal plan with healthy, figure- and kid-friendly recipes with a complete grocery list. Not only does it take the guess work out of what's for dinner, it also makes grocery shopping ridiculously easier. The plan also helps to cut down on waste too; I only buy what I need. While talking with Thomas, he told me about all of the new things going on at MealFit, including the new program for new mommies and those wanting to detox and re-boot their system, The NEW YOU 2015 Package. 28-Day Teatox from Lyfe TEA to detox and “re-boot” your system to get you off on the right start. 28-Day supply of Morning tea and a 28-day supply of the evening detox tea. 28-Days of MealFit. Complete 28-day meal plan with the goal of Maximizing Fat loss and improving your fitness. This package includes a complete detailed grocery list so you are buy just what you need and not wasting money at the store. 28-Days of at home workouts. 28 workouts that will walk you through the first steps of getting physically in the best shape of your life. This aspect will include 28 detailed workouts complete with a video that details the movement standards. I don't know about you, but after the holidays my system needs a serious detoxing and re-boot. To sign up for the New You Package, click here. Now, I don't want to go rubbing something in your face you can't use too, so with the blessing of Thomas, I'm posting a week of the Meal-fit Paleo plan, with grocery list, so you can join me in taking the guess work out of creating healthy meals and the stupid grocery list to match. One of my favorites on the list is the Crockpot Mu-Shu Lettuce Wraps! YUM! And last, one lucky winner (Open WORLD WIDE!) will win a month of MealFit! During the month of February, each week you will get a meal plan with grocery list designed to feed your family healthy meals! Sign Up Below!